Located in Pai of Torri Del Benaco, the Residence Lake Garda is located in a park of 6000 meters fully equipped with panoramic swimming pool provided with solarium, fitness area, whirlpool bath, playground for children, barbecue, club house. The large free private parking with access from the main road, allows you to park comfortably also minivan and speedboats on wheels. An excellent location in front of Lake Garda offers a breathtaking view. All apartments have terraces overlooking the lake and are tastefully furnished and equipped with everything. Children set under 3 years free: cot / high chair etc. The property overlooks Lake Garda, offering its guests a private pier and a beach with clear and fresh water. Less than 5 minutes on foot you will find bars, restaurants, boarding for the ferry boat, bus stop, tourist trails. You can also rent a bike and cycle along the lakefront. The Residence Lake Garda is situated in a perfect location for hiking, sailing, windsurfing and canoeing. Nearby there are plenty of golf clubs and amusement parks. The friendly staff will be happy to assist you with tour bookings and tickets purchase for cultural and sporting events. 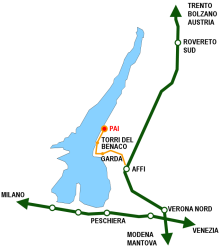 The Residence Lake Garda is just 15 minutes from the A22 Affi exit motorway and 40 minutes by car from Verona. Everything has been thought through with great care and attention to details. Each apartment has different colours, for who understands chromotherapy: red, yellow, light blue, blue, greeen, orange, violet, fucsia. The materials come from different parts of the world: Camellia in provential style, Corn Flower with its drapes in English floral style from Brighton, Gardenia antique style with its lire-chairs and table form the 18th century with antique-style marble. Our Beds are all in hand crafted iron, created and decorated by a known craftsman, a skilful art shich has been past through generations. The Residence is Ideal for Families with children, who want to spend a holiday in tranquil surroundings. Thanks to the huge park (6000 square meters) of green area you will be able to play, have a walk or swim in our swimming pool. And on request, if you wish, your children may do a personalized swimming course. Ideal for Honey-moon couples, who are looking for a romantic place in which to gain new sensations, relax and silence, and why not … finally… let you unwind in the open air whirlpool at 38° degrees C, 2 flutes of champagne, accompanied by our favorite melody stimulated by the perfumed essential oils of the hydrotherapy … immersed in your thoughts. Ideal for large Groups who are looking for a different holiday that combines both nature and sports. The Residence Lake Garda is only a few meters as the crow flies from Lake Garda, 5 minutes walking. Our apartments are all on garden level, the Mini are of 28 sqm (for singles / until 3 persons), the One-room Apartments are of 35-38 sqm (for a couple and/or 2 children), whilst the Two-room Apartments are of 40-45 mq (for 4 adults / until 6 persons). All apartments have a private terrace of 20-30 sqm with amazing Lake View and are furnised and equipped with all comforts. A supermarket, always open and the whole day, is just at 5 minutes of walk. Those who do not have a car, will find a bus-stop at only 300 meters distance that will enable them to reach all villages of Lake Garda. During the summer, there is a free shuttle service for turists which passes by right before our gate. Our Residence is also available for Ad-Hoc Events, a Company who organises for years Business Events, Formative Outdoor Courses, Weddings, Baptisms, Communions, Birthday and Doctorate Parties, bachelorhood-goodbye Parties and even more. Moreover our Location might be hired for any kind of Event. A fully equipped kitchen is at your disposal if you will feel like cooking yourself or if you prefer that a catering service prepares your personalized banquet. To all our loyal guests of the Residence Lago di Garda, we thought a great offer against crisis valid through summer 2018, for all reservations made from this site. For all reservations, the deposit at the time of booking is only 10% (instead of 30%). For all stays of almost one week, 10% discount on the total amount of the reservation. 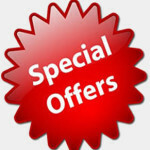 In addition, until May 31th, discount of 10% for all bookings regardless of the number of nights! To get the offer, send a request for a no obligation quote (we respond to everyone within 24/48h) or call us at +39 3316430035 in office hours.